The Red Admiral Butterfly belongs to the vanessid group of butterflies. All vanessid butterflies have special taste organs located in their feet. It feeds mainly on flower nectar. It also feeds on nettles and clover in the Spring and Summer, as well as on common flowers such as buddleia, Michaelmas daisy (New York Aster), and ice plant. It particularly likes daisies of the family Asteraceae because each flower contains a high concentration of nectar. 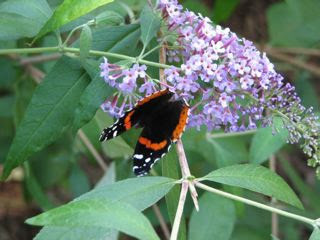 The Red Admiral also feeds on ivy flowers and the juice of rotting fruit such as apples, which it shares with wasps. The female Red Admiral Butterfly lays up to 100 eggs per day, one at a time, on a wide range of food plants, generally choosing nettle, or occasionally the hop plant, on which to lay them. When the eggs hatch, the caterpillars pull the leaves around them to form a protective enclosure and then spin silken threads around themselves as protection from predators as they feed. Many gardeners have found these types of leaves and removed them from the plant not realizing that they are destroying butterflies in progress. Inspect leaves of favorite plants from May onward for eggs. The Red Admiral caterpillar has spiky extensions on its body that deter most birds, except the cuckoo. They are also vulnerable to attack by wasps and flies. Once fully grown, the caterpillars move to a hidden spot on the plant where they shed their skins and spin a cocoon (chrysalis) with gold-colored markings. It only takes 4-7 days to go from egg to chrysalis and 2-3 weeks from chrysalis to pupation. During the time of pupation, the adult structures of the insect are formed. The wingspan of this butterfly is 2-3 inches. Although this butterfly is commonly seen in temperate areas, it is actually a migrant from the Mediterranean regions of Europe, Guatemala and the Antilles. It flies north each Spring to its breeding grounds and the offspring remain at the breeding grounds through Summer and into Winter, lacking the instinct to return south as cold weather approaches. 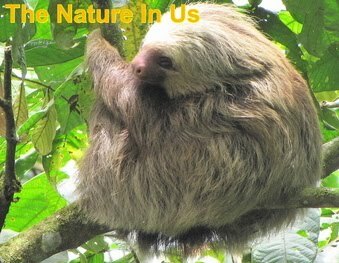 It attempts to hibernate in tree hollows, rocky crevices, or among plant debris, but the cold weather soon kills it. The lifespan is about 10 months. They fly at 5-9 miles per hour. Very cool. Red Admirals are crazy about rotting fruit and they do like clover blooms. What a delight for children to be surrounded with backyard butterflies. Over the past twenty years I have had red Admiral butterflies over winter in my house (in the hall way) and I was wondering if they were a type of queen butterfly to carry on the species. Has anyone else had them overwinter in their home? From what I wrote in the article, they tend not to fly south as most butterflies do. If they find a warm enough place they don't die. Apparently the word has been around about your hallway. Is this an area that is not as cold as outside, but still chilly enough to keep them motionless? The ones that have been blessed with your hospitality are surely happy. I found your article very helpful, I am planning on raising a few and this information is very interesting. I hope you post more.Do you happen to know how long it takes for a female to lay her eggs? Thank you for your comments, Resa. I've never raised butterflies so I know nothing about how long it takes to lay eggs, etc. 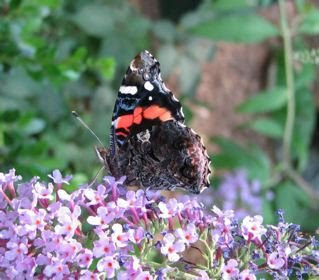 I did find this link for you on: Raising Red Admiral Butterflies. We have had quite a large population of Red Admirals fly through Erie, PA on Lake Erie. Where would they be coming from? I am trying to find out if what I am seeing is normal. I raise deer and have half acre breeding pens on 15 acres of land. I put 6-8 does per pen. I have been having a lot of problems with nettle in the pens and have been trying to have some sprayed, but once the does are in the pens and fawning I have to stop. This year I did not get much sprayed at all. My father works for me and sprayed some which was dead areas, but other areas were thick and tall. I have noticed a few weeks ago that some other areas looked like they were dying. I asked my father if he had sprayed it in the pens. He said "no". Today walking through the pens looking for newborn fawns I looked closer and noticed the nettle is covered with catipillars. Some areas so much that there are no leaves left. I would not be under-estimating there to be 1,000,000 of them on the fifteen acres. When I walked through the pens today there were trails covered in them. The only thing that I changed was I added Fly Magnet fly traps to catch any flys in the pens to alleviate stress on the animals. I added one- one gallon trap per 1/2 acre and the traps filled up with flies. 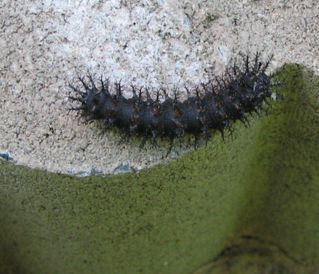 I have been looking up the pictures and the catipillars are for the Red Admiral. I have seen them here before, but have a feeling I am going to be seeing a lot more. Will they kill the nettle? Is there any harm that they can cause? They do not seem to be eating any other type of vegetation. I've never had any nettle plants on our property. Depending on what species of nettle it is it could be an annual or perennial. If it's a perennial plant, there's no way that eating the leaves should kill it ... it should come back, just as it does after the winter "eats" all the leaves. If it's had a chance to bloom and reseed, then even if it's an annual it would return. Sounds like you've got an amazing butterfly farm going on there. My daughter found a red admiral yesterday. She put it in the cage where her deceased hermit crab once lived and gave it a chunk of apple and a wet sponge. The poor thing is missing most of one of its rear wings, and the rest of its wings are also bent and broken. It has nibbled the apple (to our delight! ), and continues to walk around & even attempts flight now and then. It shivers when it's scared. She took it to school today, my little vet. How long do they live if they don't freeze to death? I don't know what it would be in captivity. As the article above says, they live 10 months until cold comes .. and that's a long time for most butterflies. I hope you enjoy it. Crushed bananas, even rotten, is enjoyed greatly by then too. I rescued a red admiral I found on the ground in the rain. Its wings are raggedy and it cant really fly, though flutters.. I am in the UK, south of England. The forst day it sat on some buddleia, but that was two days ago and since then it is quiet. How can I help it, and would it have been born in a certain month..? I guess i would just like to know if there is any way of knowing how old it might be. Also, would it have been migrating..? I live on the south coast, near France. Hello there, I recently a heard a story about a man who kept a Red Admiral over winter in a match box and every evening he'd trained it to fly to his hand and drink sugar-water (a good substitute for nectar). I have since found that a Red Admiral frequents my garden. As the weather is getting really cold I caught it and now keep it in a box with bits and pieces for it to hide amongst. In one day I trained it to sit on my finger and put its proboscis out for sugar water, have yet to train it to fly there though! Hopefully it will survive and I can release it in spring. Also, to Amanda - the shaking that the butterfly does is when its warming its flight muscles because its too cold to fly. That's very interesting on the nectar since it's not their preferred food source. In case anybody wants more info on this butterfly, here's a link to more info.